It’s Friday. It’s been a s***y week. I need this. I need beer. I need to watch two men assert their masculinity upon one another in a Gladiatorial throwback. You know what, we should probably keep a running total. It’s gonna be one of those nights. I kind of like reporting this stuff in real time, so I might as well keep a real time beer count, too. It will help to explain my quickly deteriorating grammar, punctuation and overall view of reality. oh, it’s so cold, but I’m cage side and the skeletons…I mean gentlemen at the boxing commission don’t allow me to booze this close to the fence. And now that I have spill about a quarter of the can on myself, perhaps they have a point. Time for some fights. Let’s go Ammy’s! Round 1) Baisley tries to overpower the smaller Sanchez early, but Sanchez is able to snag a single leg and get the take down, securing cross sides against the side of the cage. Baisley calls for a nut shot, but to no avail. Sanchez’s ear looks torn as he works to mount. Baisley turns to escape and briefly stands before Sanchez gets another takedown and quickly moves to mount. He is raining down some hard shots and spins to an armbar, but it is loose. Baisley gives the thumbs up that he is okay and is saved by the bell. Baisley must have felt something wrong during the fight because he looks clear eyed, but calls off the fight. Note: MMA isn’t as easy as it looks on TV is it? Can you keep going when someone is punching you in the face? The crowd seems to think they could have, I have my doubts. Round 1: The two men meet in the middle of the cage and trade blows. It is Wannemacher that gets the better shot that puts Jessen down, he dives for a rear naked but Jessen escapes and is able to eventually work around to guard. He throws up his lets and locks in a triangle, but he must have missed the BJJ class on how to tighten them, because it is in for about 60 seconds until Wannemacher finally escapes. The round ends with Wannemacher in top cross side control. Round 2: Again the two meet in the middle of the cage and trade, again Wannemacher is the one that lands the shot, this time it puts Jessen to sleep on his feet. It is a flash knockout and Jessen is awake as soon as he hits the mat, but it’s over. The ref makes the right call and waves the match off immediately. Round 1) Anderson looks patient, almost bored as Schmidtke stalks around finally getting a body lock takedown. He falls into Anderson’s guard and looks spazzy trying to work. Anderson barely looks ready to sweat as he eats shots and works angles, and actually gets an armbar/omoplata sweep, but Schmidtke immediately turns and gets another takedown. The rounds ends as it started: slowly. Round 2) Marcel lands strong shots early as he seems to have found some fire, but Schmidtke goes on the defense and gets another takedown, again landing in Anderson’s guard. They work to their feet and Anderson catches a kick, putting Schmidtke down, but he can’t get anything from it and once again ends the round with his back on the mat. Anderson is going to need to pull something out of his a** to win this one. Round 3) Anderson lands a solid kick to Schmidtke that forces a grin. The two bump gloves as a show of respect and Schmidtke quickly gets another takedown. Holy s***, where did that come from?! Anderson locks up a triangle and Schmidtke can’t roll out of it! The fight is called. Winner: Marcel Anderson via Triangle Choke at 1:30 of the 3rd round. Note: Anderson celebrates like Nate Quarry. Tears and a lot of emotion from this one. Schmidtke throws an adult temper tantrum at himself. The fights are on hold for some reason. I’m thirsty. Ooo, that first drink went down so nice. A friend in the crowd has a whiskey hook up, a chaser is much needed and much appreciated. 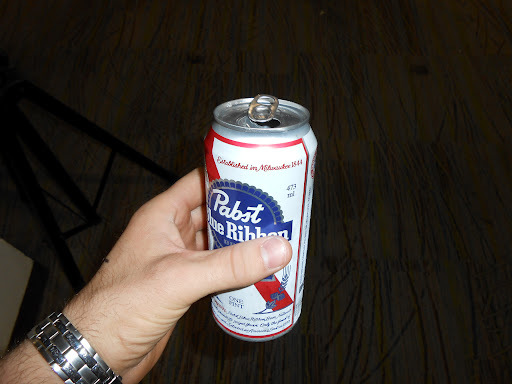 PBR, the Cristal of Beers! What! Round 1) Zinda is standing like he is filled with rage, and possible a lot of gas. Whoa, these two have HORRIBLE striking. Eyes closed, off balance, Snyder lands a kitty-cat paw to Zinda’s neck. Zinda gets the takedown. Well, this is new. Zinda is grunting and yelling with every body shot. What the f*** is that? The rounds ends pretty poorly. Round 2) The two smirk at each other for absolutely no reason. They seem to think that each other has good striking. They don’t. Zinda gets another double and Snyder wants an omoplata. Zinda gets a huge slam for the attempt. The round ends with me laughing my a** off thanks to Snyder’s corner yelling “The guy can’t wrestle, he’s from f***ing Wisconsin!” It is the most entertaining thing so far this fight. Round 3) …..zzzzzzzzzzzzzzzzzzzzzzzzzzzzzzzz………zzzzzzzzzzzzzzzzz…………….zzzzzzzzzz……..huh? There’s a fight going on? Oh, it’s on the ground. Snyder is on the bottom for about a minute too long due to inactivity. The ref stands the fight way too late, it’s the 3rd round after all. The fight ends. Gee, I wonder who won? Note: I predicted before the fight that Zinda is a crier. “The Polish Mongoose” takes the opportunity post-fight to say how great America is. Cool. Original…why are you talking? You are not a good fighter. What garage do you train out of? Round 1) The fight starts quickly. Saric throws all kinds of kicks from all kinds of angles. Lene tries his own, but no one really lands anything. Lene drives for the takedown and Saric pulls guard. It looks like Saric got cut. Lene eventually decides to stand and the ref puts the fight on hold while the doc checks him out. He’s okay and the two end the round throwing flurries. Saric’s eye is dripping blood. Round 2) Saric starts with a big flurry, but it is Lene that gets the big slam. The two work a little but eventually stand. Lene lands a beautiful kick and a follow up cross that spins Saric and another cross for good measure, but Saric is still standing. The kid has a chin of granite. Saric dives for the takedown, but Lene gets mount out of it. Saric turns and Lene immediately sinks the RNC. Winner: Randy Lene via rear naked choke at 1:36 of the 2nd round. Round 1) Cadotta looks intense and the two trade a lot of misses. Cadotte twists for a judo-ish takedown and Vo turns to guard. Vo keeps his hips moving and turns guard into a belly-down armbar. Strangely enough, even though Cadotte’s corner yells out “he’s doing that jiu-jitsu stuff” he doesn’t know how to defend. Madness! I think I deserve to be sponsored by PBR. 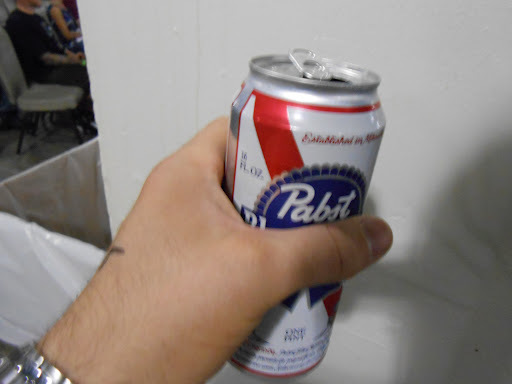 If for no other reason than to help change the image of a PBR drinker from some douchebag in horn rimmed glasses, plaid shorts and some dumb little hat to my own personal personification of the jeans and t-shirt wearin’ temple of All That Is Man that I embody on a day to day basis. Okay, with this except of my wardrobe that’s a flat out lie, but at least I don’t hang out in Uptown and rave about bistros, talk politics and smell of patchouli. Round 1) Believe it or not, this isn’t really a mismatch. Johnson gets the power double almost immediately and starts throwing jackhammer shots. No power, he’s just trying to get the fight over with. Bascovsky works his hips and gets to Johnson’s back. Johnson tries to stand and even flip to shake him, but Bascovsky isn’t going anywhere and keeps hunting for the rear naked choke. Eventually it looks like Johnson just gives up and Bascovsky gets the tap. Winner: Mark Bascovsky at some point in the 1st round via rear naked choke. Round 1) Wales throws a hard kick to the body, but Magdaleno stands in the pocket without flinching, getting a huge takedown for his toughness/stupidity. Wales works back to his feet eventually and starts using his muay thai with knees to the legs of Magdaleno. Magdaleno reverses the control and throws Wales to the mat. He gets an arm control and turns Wales over. He throws two hard punches and the ref stops the fight. Some aren’t happy, but Magdaleno has a lot of people with him and the crowd explodes with celebration. Winner: Pat Magdaleno via TKO due to ref stoppage at 1:50 of the 1st round. Explanation: Yes, it was a fast stop. Too fast. When Dan was on his stomach, he arched up, as he dropped to defend his hands slammed the mat like he was tapping. The ref double clutched and when the strikes landed he ended it. It was a tough stoppage, but sometimes being a ref is really f***ing hard. Round 1) Locken abandons what I expected to be early muay thai for a double. Wolff gets a good sprawl and locks a keylock grip. He wants the kimura and it is solid. Locken keeps driving for the takedown. Are you f***ing kidding me! Look at this!!! Yeah, I’m covered in blood. It’s on my laptop, my fight sheet, my jeans and my shirt. Nice. Thank God for pre-fight testing. And whiskey. I’ll take this harder when my buzz is gone. Wolff is landing vicious elbows that have cut Locken wide open. Blood is everywhere. This fight is over. But not before I get douched with someone else’s DNA. Winner: Caleb Wolff at 1:40 of the 1st round due to TKO via exsanguination. Look it up, it’s funny that way. Round 1) A lot of feeling out early. A lot. A LOT. Slowly Kiser is finding his range with kicks and Crow isn’t doing much in return (you’d think he’d have more energy now that he is off suspension). Winner: Dan Kiser at 3:43 of the 1st round due to Crow being a *****. Yeah, that’s official. Now I get it. I’m going to need another beer soon to help me cope with this self-realization. Hmmm…I just said the word realization out loud and it sounds more like realalishashason. Perhaps instead of a sponsorship deal, I could just get them to cover my cab fare home. Round 1) Barker looks to have flat feet and McKinney score the early takedown. Barker turns his hips and gets open guard. McKinney moves to mount, but Barker keeps him tight. Eventually, Barker gets back to half-guard. McKinney throws the leg for a pass and lands a left cross on the way down to cross sides. Again Barker stays mobile . McKinney lands a solid cross as the round ends. Round 2) Barker shoots for the takedown early and McKinney defends well. Barker ties up and McKinney lands a crisp knee to the head. Now McKinney is finding his rhythm. He gets Barker with a bear hug takedown and lands solid shots from top half guard. Still Barker stays mobile and moves away. He looks exhausted in the corner as the round ends. (between rounds) Damn, I love a ring girl that likes her job. Thanks Amy Krog (by the way, awesome name!) for shakin’ what yer momma gave ya! Yup, gonna have to friend you on facebook. Wow. Round 3) McKinney looks composed. Barker is hurting and cut wide open under his eye…are you kidding? 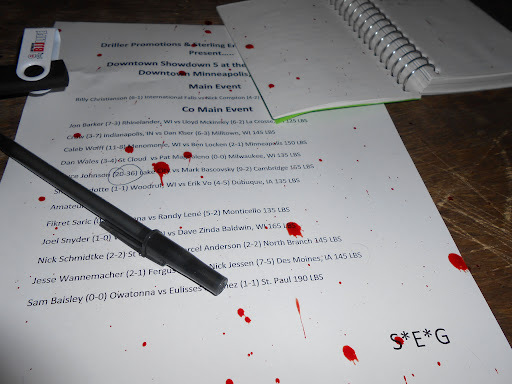 More blood on my card…crap, anyway…this is just short of amazing. What the last guy lacked in heart, Barker makes up for. Every shot is answered with movement away. The kid just won’t give up. I love this stuff!! Words can’t describe so I won’t do the injustice of trying. Barker’s heart is unbelievable! Note: Amazing fight. Amazing heart. Does this get better? Round 1) A lot of back and forth before Christianson finally gets the takedown. Compton immediately gets to guard and goes for a belly down armbar. It is deep and Christianson’s arm looks bad, but he won’t give up. He escapes! Compton again sets up another armbar and Christianson slams his way out of it! A punk sweep by Compton! And Christianson, from turtle, drags him over the top for a takedown! Compton gets to his feet, goes for a takedown and ends up in Christianson’s guard. The pace is incredible as the round ends with Compton landing unanswered strikes. Round 2) Christianson is stunned from an early left hook, but doesn’t fall, this kid is tough. He reverses the clinch and is able to pull the takedown then works to north/south. Compton is mobile and works for yet another armbar. Again Christianson escapes! Christianson dives for an RNC it looks good, but too shallow. Compton backdoors and controls the turtled-up Christianson. I can’t believe this fight. Nothing short of incredible! The round ends with Christianson surviving at least 60 seconds of unanswered strikes from turtle. Round 3) I can’t write. I need to watch this. This is crazy. 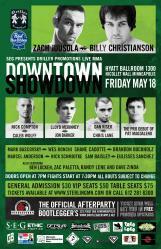 Each fighter is putting more effort into this than almost any UFC, WEC, Strikeforce or any other fighter out there. The back and forth is sick. Compton looks to be getting the better of the control. Oh, Christianson is hurt. It is purely defensive now, but he won’t fall. He's against the cage and just trying to avoid knees and punches. Again he works out of it, but Compton is still throwing. Finally, mercifully, the ref stops in. This fight is amazing, and it is over. Winner: Nick Compton via TKO at who-gives-a-s*** of the 3rd round. Fight of the night, knock out of the night and I wish I could give it submission of the night. 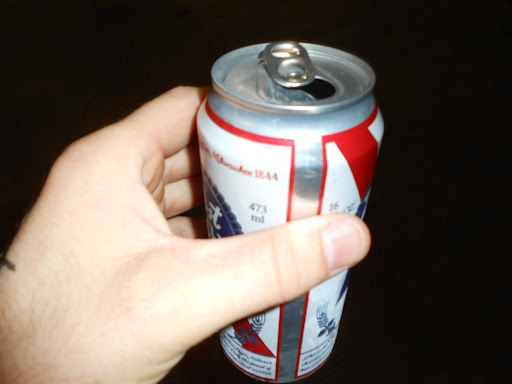 A-M-A-Z-I-N-G.
How am I supposed to get to sleep after this…oh yeah, PBR #5, here I come baby! I would also like to thank Bobby Brunette of the Minnesota State Boxing & Combative Sports Commission and Golden Gloves President for some great cage side conversations. It is always great to talk with someone who appreciates both MMA and The Sweet Science!